Recognizing the value of good design is important to the industry and helps to inspire us, and so many others, to continue to put forward our most creative and innovative ideas, and work together with talented partners and suppliers to build the best homes for our clients. We couldn’t do what we do without our homeowners – and we want to sincerely thank them for allowing us the opportunity to work together to help them achieve the home of their dreams. It was an incredible year of home design and we are honoured to have been acknowledged by many of our industry peers, colleagues and partners over the past twelve months. 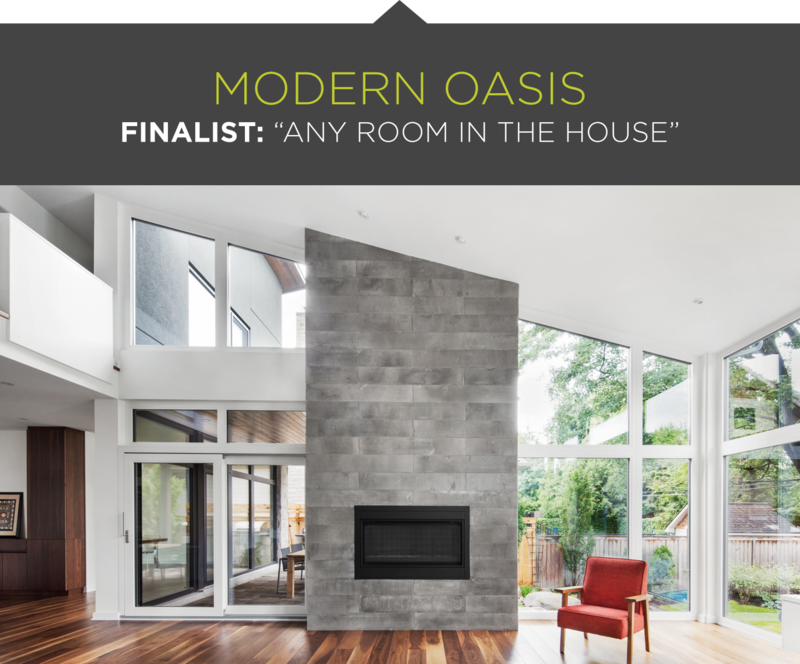 Most recently we were humbled to have been named as finalists in 11 categories, and were winners in 6, at the Annual Housing Design Awards presented by the Greater Ottawa Homebuilder’s Association (GOHBA) on Saturday evening. 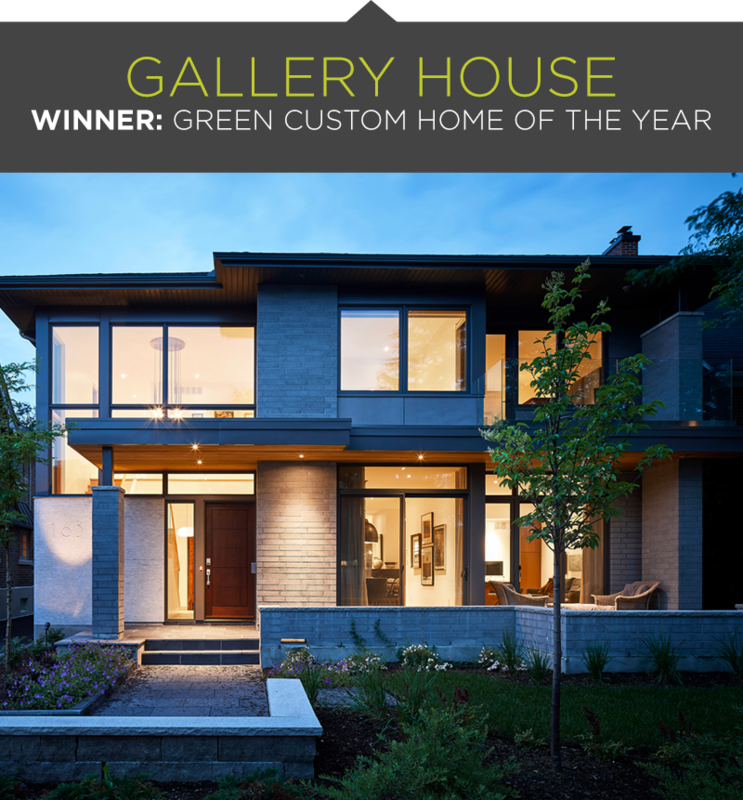 Our Gallery House won GOHBA’s Green Custom Home of the Year. This is especially rewarding as our firm strives to provide great design while reaching extremely high standards for energy efficiency and environmental responsibility. Indeed, in partnership with RND Construction, our firm has won Green Custom Home of the Year 4 times in the past 5 years. 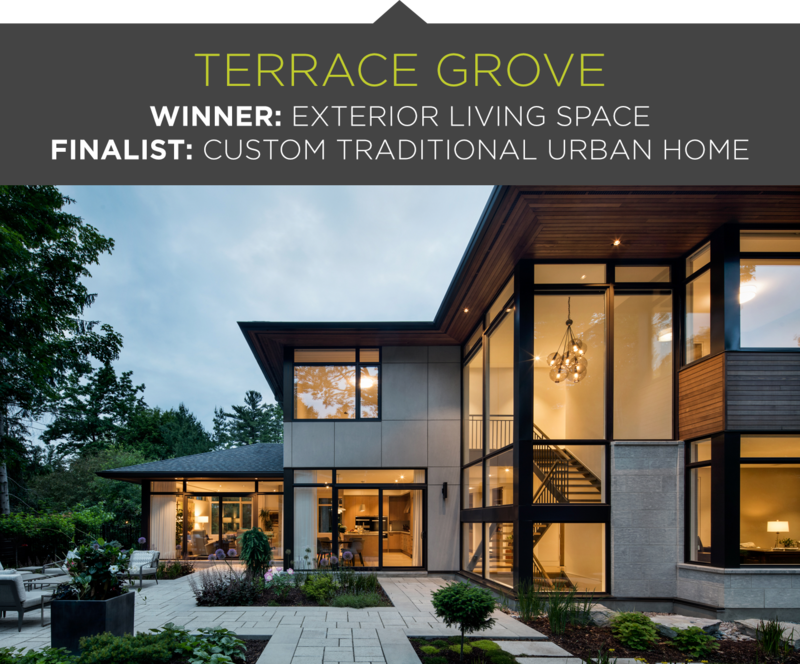 In addition this home was a Finalist for Urban Traditional Custom Home. The extreme change in grade across a shallow lot presented challenges for the design of this contemporary home. The solution was found in an unconventional way, by locating the front door on the lower level of the home. This would normally be a problem, but here the floating staircase and interconnected floor levels allow people on main floor to see who is coming to the front door below. Click through to see more of the Canal Terrace House. This home was another great partnership with Larco Homes. This traditional home presents two very distinct faces. Nestled into the streetscape at the front suggests a modest structure – but at the back a two-storey volume with abundant glazing opens the home up to a private garden oasis. The entertaining terrace offers a wholly outdoor experience, an enclave surrounded by breathtaking gardens. Floor to ceiling windows flank the stone patio, giving the living room, kitchen and stairwell expansive views of the meticulous landscaping. Working with the existing mature trees, a mix of lawn, plantings and groundcover, were introduced to create the garden oasis. It was a pleasure working with 2H Interior Design and Cada Construction on this home. 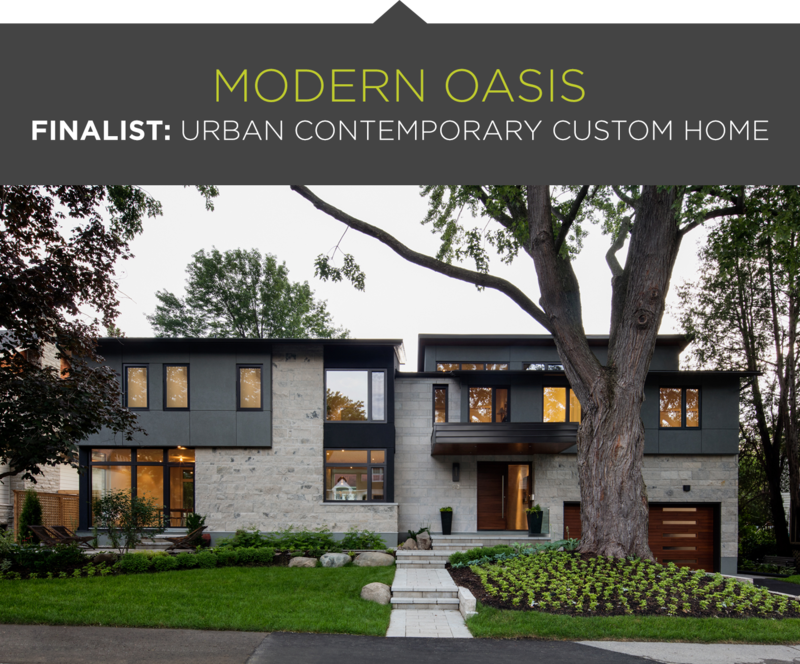 The exterior material palette of stone, stucco, and wood of Modern Oasis blends harmoniously with the homes of the established neighbourhood. Providing elegance and a sense of wonder within a functional plan for a busy family, this modern home was envisioned as a pavilion in the garden. View lines in the floor plans were carefully considered to thoughtfully compose the experience of the space and ensure that all rooms have a garden view. Thanks to builder, Just for Homes Inc. This lofty living room was envisioned as a pavilion in the garden. Positioned at the centre of the home, it is encircled by the kitchen, terrace, stair, and upper hallway. Indoor and outdoor spaces run seamlessly into one another. Floor to ceiling windows provide expansive views of the garden and pool and illuminate the interior. The sloped ceiling form gives a gentle dynamism to the internal volumes, while walnut floors ground the space. See more photos of Modern Oasis. 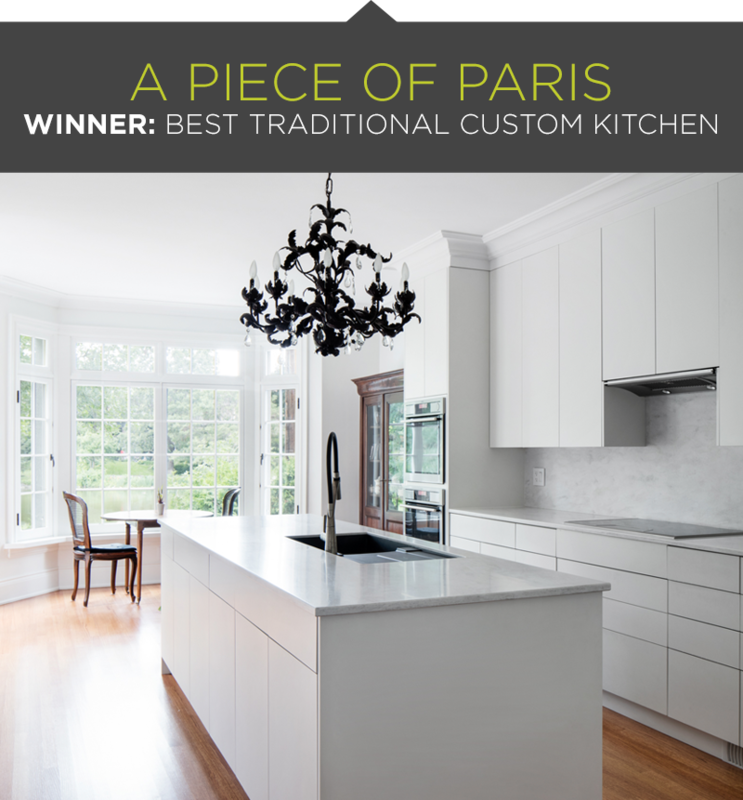 “A Piece of Paris” won the judges’ hearts this year – winning both Best Renovation and Best Traditional Custom Kitchen in its size category. A long relationship with Paris led our clients to recreate a piece of the city they loved. 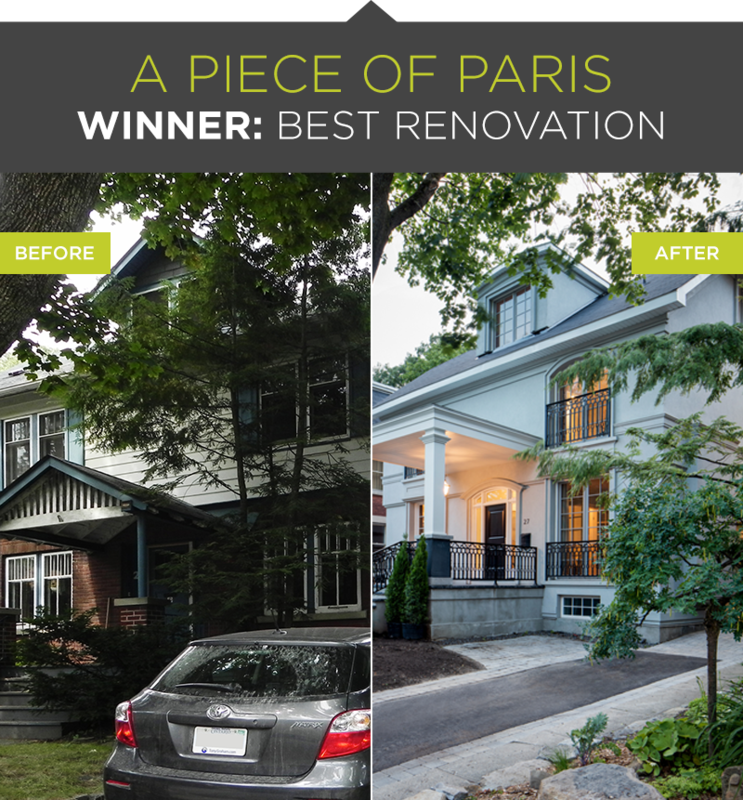 This renovation revitalized a fire-damaged, turn-of-the-century house into a timeless and sophisticated residence for a well-travelled Parisian-loving couple. The home exudes a calm elegance, subtle paint colours and white oak flooring to create a tranquil atmosphere for them to enjoy for years to come. The kitchen of A Piece of Paris features a stunning bay window and sitting area with picturesque views of the park. A French door gives direct access to the back terrace. A sleek black and stainless faucet and dramatic chandelier create contrast in the all-white kitchen which features Caesarstone countertops, glass-front cabinets, and crown mouldings to complement the home’s Parisian-inspired interior. Partnering with Larco Homes, these semi-detached homes were designed with urbanites in mind, providing large open living spaces. The innovative front-to-back, semi-detached homes range from 1,700-1,830 sq.ft. over three levels, plus finished floor space in the basement. Pulling the two masses apart allows windows on both sides of the home, compared with the more traditional side-by-side plan which limits glazing to the front and back façades. 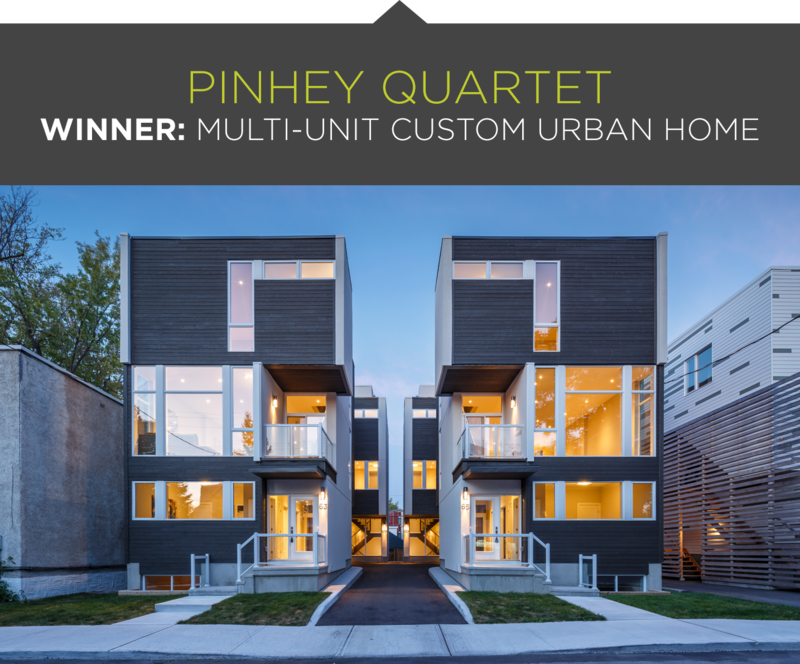 We are also very proud that Pinhey Quartet won a City of Ottawa Award of Merit as the City celebrated the best of design excellence at the Urban Design Awards held on October 17th. Our firm has been working with HN Homes over the past few years designing models for their various sites across Ottawa. 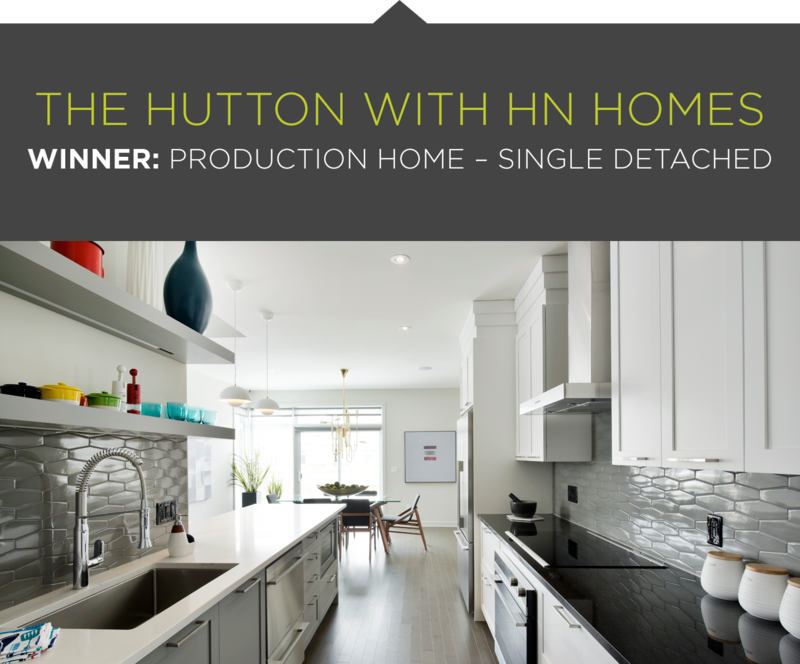 This year the Hutton model was entered and won Best Single Detached Production Home in its size category. Homeowners of The Hutton model gravitate towards this home’s dramatic space and openness. The vertical volume of space keeps the second floor loft visually connected to the lower level living area. The sculptural stair contributes to this effect with strategically placed glass guards and openings. The interconnected spaces keep families feeling close and connected, making it one of the most popular model choices for HN homeowners. 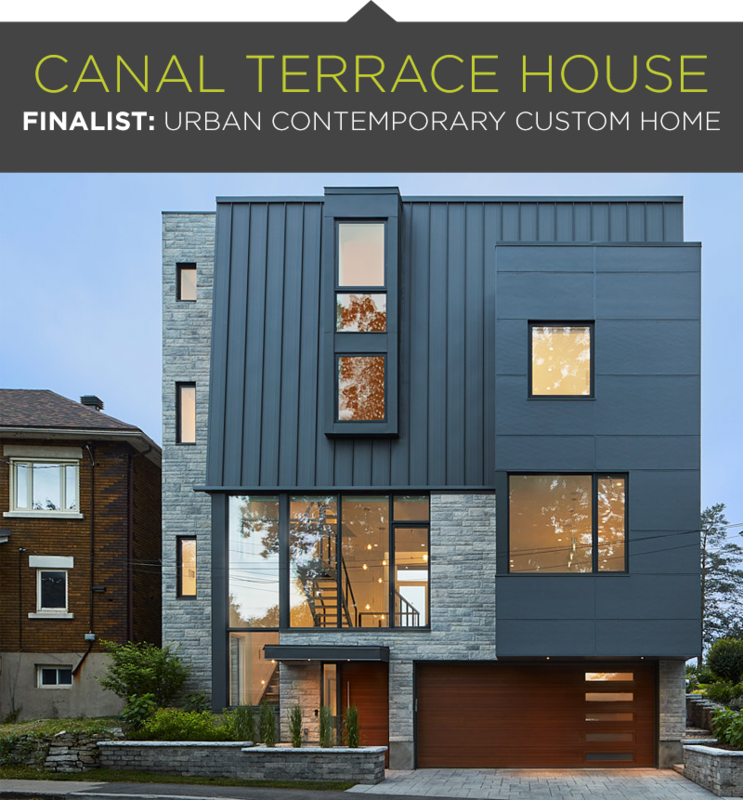 We also had the good fortune to win awards at OHBA, CHBA and the Ottawa Urban Design Awards. Our firm, with partner RND Construction, was a big winner in 2017 with our Revelstoke Drive home. 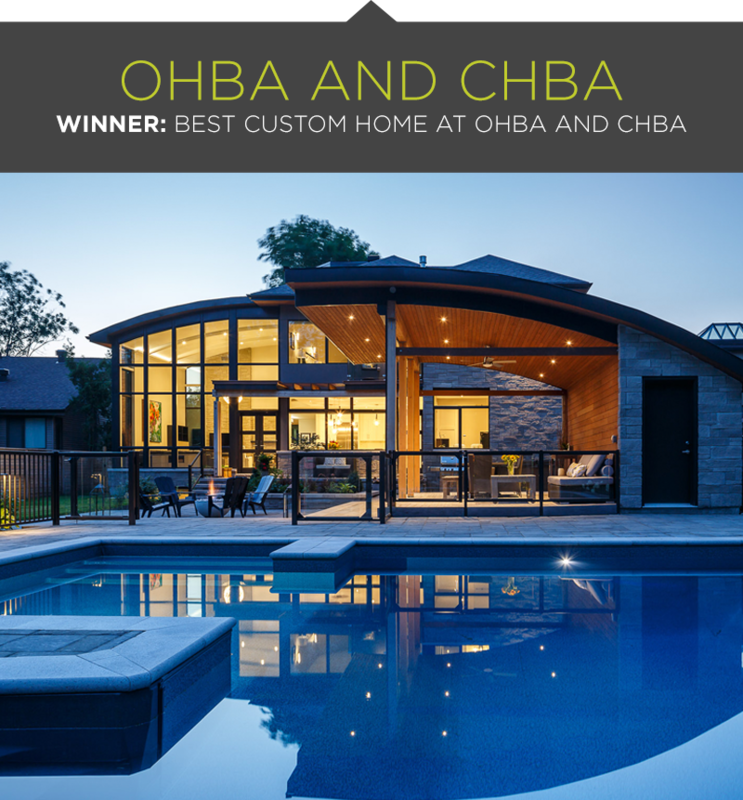 It won top honours at both the Ontario and Canadian Homebuilders Associations’ Housing Design Awards – winning Outstanding Custom Home at OHBA and Best Detached Home at CHBA. 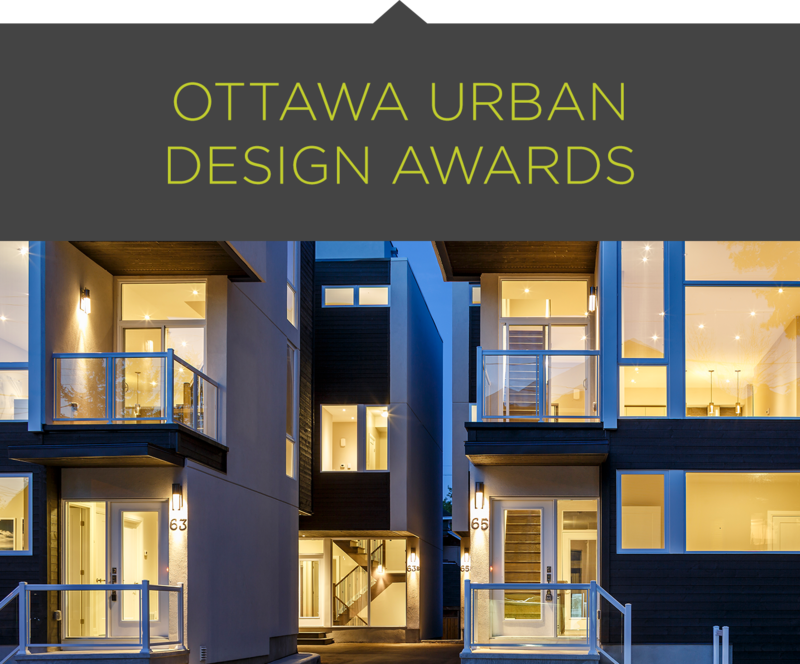 The Ottawa Urban Design Awards is a biennial awards program that celebrates projects built in the City of Ottawa that achieve urban design excellence. 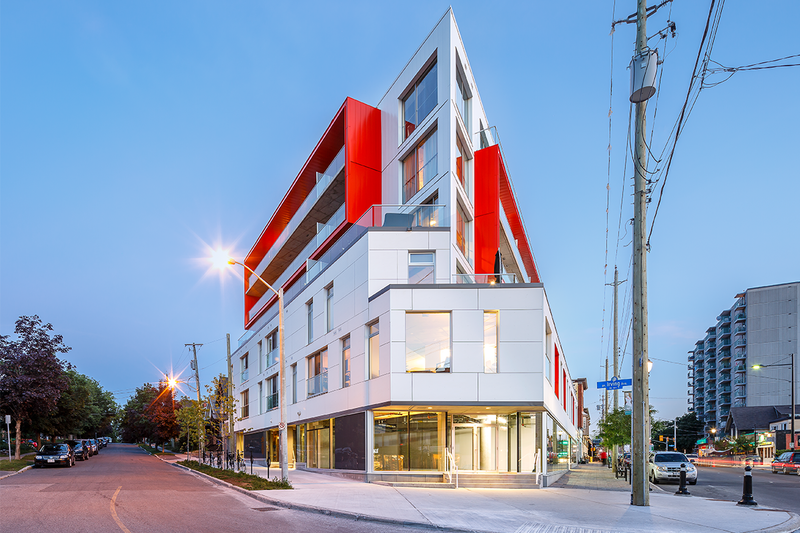 We received two Awards of Merit at this year’s ceremony – one in Urban Infill Low Rise for the Pinhey Quartet with project owners Larco Homes, and the second for Urban Infill Mid to High Rise for The Eddy, with project partner Windmill Development Group. We want to be a part of your conversations wherever you are. 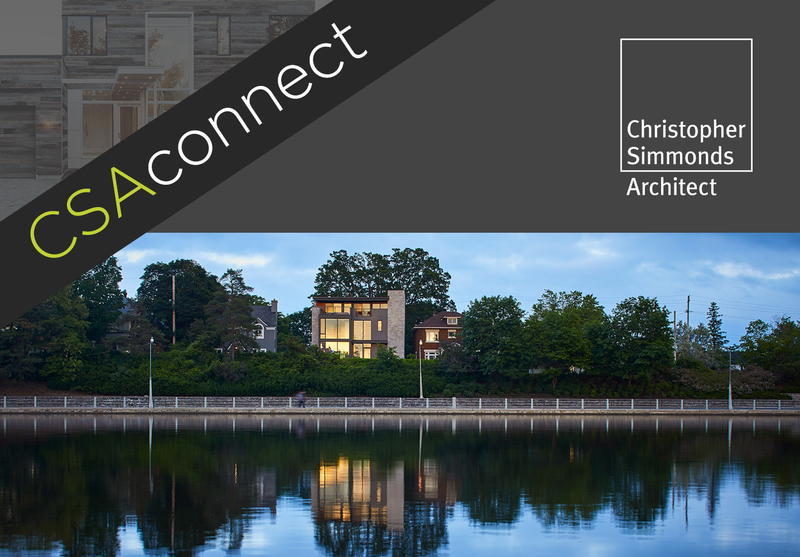 Connect with Christopher Simmonds Architect on Instagram, Facebook, Twitter, Pinterest, LinkedIn, and Houzz by clicking on our Social Media buttons below. Copyright © 2017 Christopher Simmonds Architect, All rights reserved.